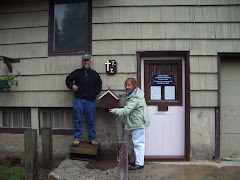 In Bush Alaska, Altar Serving can be somewhat different than in a large parish. Any children who attend mass in a home, a school, a cannery, or a school gym is susceptible to being called to altar server duty. 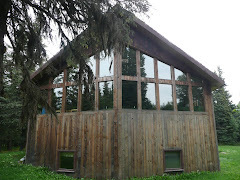 Altar servers in the Alaskan Missions have duties that are unfamiliar to servers in larger parishes. 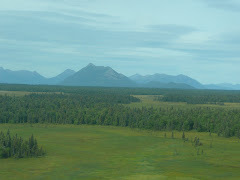 For example, I carry a mass kit when I fly into small villages like Levelock, Illiamna, and Clarks Point. Budding altar servers love to help me unpack my mass kit and pack it back up. There are absolutely no albs for servers to wear except in the villages of Dillingham and King Salmon. 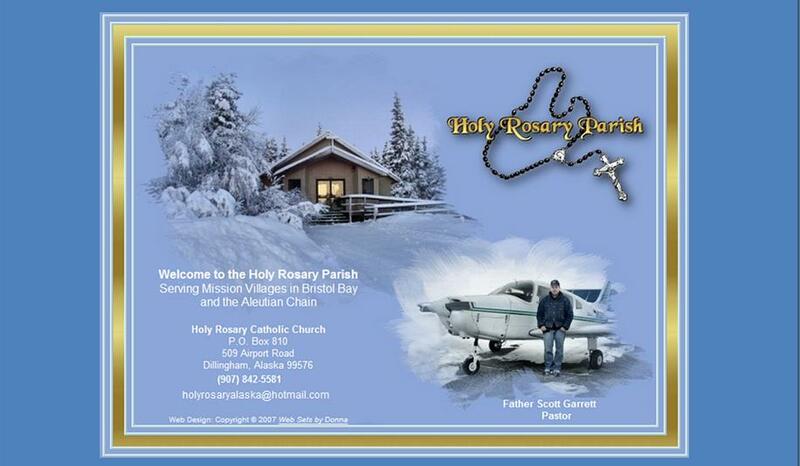 Holy Rosary has the largest congregation in the Bristol Bay/Aleutian Chain mission. We average about 45 people at mass every Sunday. 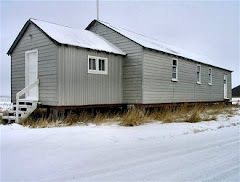 Saint Theresa in King Salmon/Naknek has about 15 regular parishioners in the winter and that doubles during the fishing season. The credence table is an important part of the altar server experience. 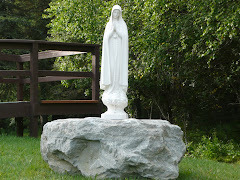 Here is what ours looked like last week before mass began at Holy Rosary. Alter Server 2: In charge of the four B’s, (Book, Bowl, Bell, and Bottle). The book is the sacramentary, which altar server 2 gets to hold. The bowl is the water bowl for the Hand Washing Ceremony. The Bell is that which we ring when elevating the Blessed Sacrament (the most favorable and cherished job of altar servers). The bottle is the water bottle used when we mix the water with the wine. Altar Server 1 (Lead Altar Server): In charge of EE (Everything Else). Everything else, for example, carrying the processional cross, actually pouring the water over the hands during the hand washing ceremony, and removing the chalice from the altar after communion. The major rule that governs all of our Alaskan Bush altar servers is this: The best altar servers are those altar servers who do not draw attention to themselves while serving. If you forget what to do, look reverent. Here are some more pictures taken by Becky Chandler last week (during the fourth Sunday of Lent, 2009). After the procession, Josh, altar server 2, holds the Sacramentary (first "B" for book) for the opening prayer. Notice the shoes of both altar servers! Black, not tennis shoes. Altar servers light candles from candles on the altar and hold them during the reading of the Gospel. We always have children bring up the gifts. Here Brian and Josh await the gifts, which have been brought forward by Alethia and Katelynn. Josh, altar server 2, awaits with the third "B." The third "B" stands for bottle, or the sacred water cruet used to pour water into the wine. During the hand washing ceremony, Josh (altar server 2) holds the second "B", which stands for bowl, while Brian (altar server 1) does EE, which is everything else, i.e. pours the water over my hands. After communion the Blessed Sacrament is consumed. 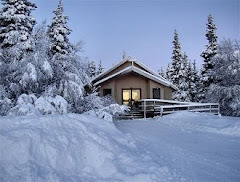 During mass in the Alaskan Bush communities, the Tabernacle gets little use. On the other hand, there always has to be enough Blessed Sacrament inside the tabernacle to distribute during communion services. Aileen Walsh is always ready to perform a communion service if I get stranded out in the missions in bad weather. Notice the nice posture of the altar servers, hands together, standing straight, and looking reverent. One of the favorite duties of Altar Server 1 is to clear the chalice from the altar after I have purified the sacred vessels. Here Brian slowly and carefully folds up the corporal and puts it, with the purificator, tabernacle key, and pall on the chalice and carries it to the credence table. Once again, Josh holds the Sacramentary (first "B" for book) for the prayer after communion. During the recessional, Brian (altar server 1) carries the cross, which is not one of the four "B's" but is included in EE (everything else). Brian, who is holding the thurible, is the only altar server trained out to be a thurifer. He can't wait for Easter to perform that duty again. Happy altar serving to all of you dedicated servers out there! Remember, do not draw attention to yourselves and look reverent at all times! 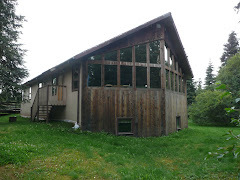 Levelock is a small village between Dillingham and King Salmon. 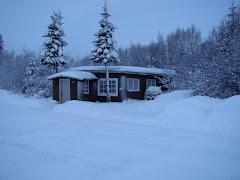 It has nearly seventy people living there year around. 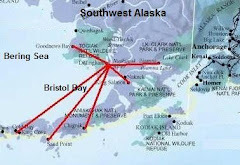 The village is about 20 air miles northwest of King Salmon and about 53 air miles northeast of Dillingham. I normally fly in for mass every two months or so. The airport is located about three miles from the village. 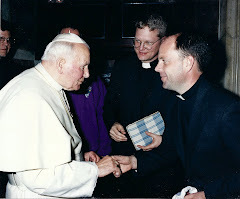 I call George and Napatie on a Friday if I plan to celebrate mass with them that weekend. If George does not hear from me by 10:30 AM he rides his four-wheeler out to the small dirt strip to pick me up at 11:00 AM. In other words, if the weather is too bad for me to fly out, I call him about 10:30 AM to tell him I will not be coming. We always have a back-up plan if the weather is lousy, i.e. we will try again next Saturday. On a previous visit one Saturday morning the wind picked up just as I arrived at Levelock. It was gusting to 35 MPH (which is considered a gale). I circled the small runway in my Cherokee Warrior II a couple of times and decided not to land. I flew on to King Salmon, where the runway is much longer and wider. I felt terrible not landing in Levelock after I found out that George had been waiting for me on his four-wheeler with his newly adopted seven year old son Tuwon. Tuwon had just arrived from Thailand the week before and was all dressed up in his best suit to meet me for the first time. The attendance at mass in Levelock, Alaska varies. One time I had about eight children and four adults. I have had as many as eight adults and four children attend mass in George and Napatie’s home. Here is a picture taken last year. From left to right is Napatie, little Joanna, me, Becky, and Benita. Below are a few pictures I took the Saturday after Ash Wednesday, February 28, 2009. We celebrated Ash Wednesday on that Saturday rather than Ash Wednesday. Why you may ask? Well, it is difficult to fly to several villages in one day so we do the best we can. Here is a picture of the Levelock airport just after I landed. My plane is in the background. 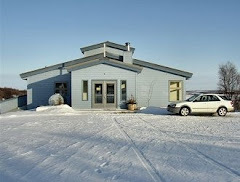 There was 2-3 inches of snow on the dirt strip, which was covered with a thin coat of ice. My Pilot training never taught me how to land on short, soft, snowy, and icy runways. Although the weather was rather warm, in the mid twenties, I decided to put on the engine cover to keep it warm. 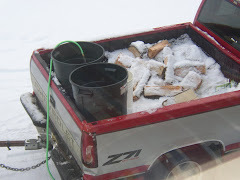 Even in 20 below zero weather, the engine will still be warm enough to start after two hours. George was a couple minutes late picking me up. He had to run some children to the school. A few minutes after I started walking, he came tearing down the snowy road. Shown below is the new shelter he built for his four-wheeler. After a good wind he says he has to make a few adjustments. 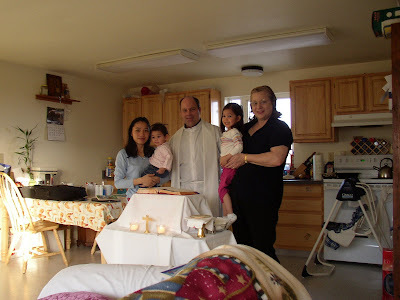 George and Napitie’s three children, Joanna, the youngest, Benita, and Tuwon help me to set up for mass. They love taking the sacred vessels, altar cloth, candles, and books out of my mass kit. I had fog on my camera lens from the ride in on the four-wheeler so this picture was a bit blurred. Before receiving the ashes the three children pose for a picture after setting up the altar. From left to right is Joanna, Benita, and Tuwon. George is feverously preparing for one of the readings and Napatie could not be prouder of her three beautiful children. Out in the Alaskan Bush, we do not care how old the altar servers are. The only qualifications are a big smile and a steady water pouring hand. With ashes on their foreheads, here are Benita and Joanna ready for the Hand Washing ceremony. Before I flew back to Dillingham, Napatie whipped up a delicious sandwich, Joanna gave me some pictures she drew, and Tuwon and Benita showed me some of the crafts that they had made in school. 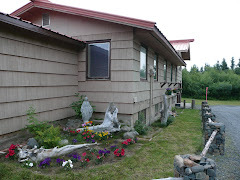 For more information about celebrating Catholic Mass in the Alaskan Bush, please do not hesitate to call.